Born in Mumbai, India, Dinesh D'Souza came to the U.S. as an exchange student and graduated Phi Beta Kappa from Dartmouth College in 1983. A former policy analyst in the Reagan White House, D'Souza also served as John M. Olin Fellow at the American Enterprise Instituteand the Robert and Karen Rishwain Fellow at the Hoover Institution at Stanford University. He served as the president of The King's College in New York City from 2010 to 2012. 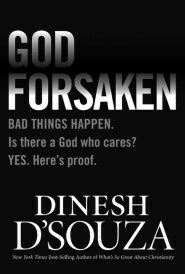 Dinesh D'Souza is the type of intellectual who has callouses on his hands, he knows what is worth believing and he has an uncanny gift of communicating the 'why' of those beliefs in a way that disarms skeptics and makes sense to everyday people. I've seen and heard Dinesh D'Souza in a number of venues, as a speaker--and twice as a debater--for my own Socrates in the City speaker series in Manhattan. There is no one whose knowledge and presentation of the facts is better.